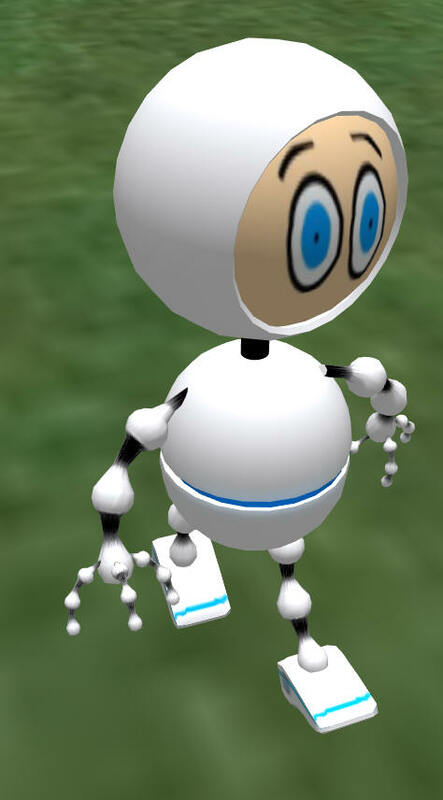 You can add 4 animations to your pet robot to get it to stand, walk, sleep, and look. Step 1: You will need to give birth to a robot, and reset the xs_brain script. 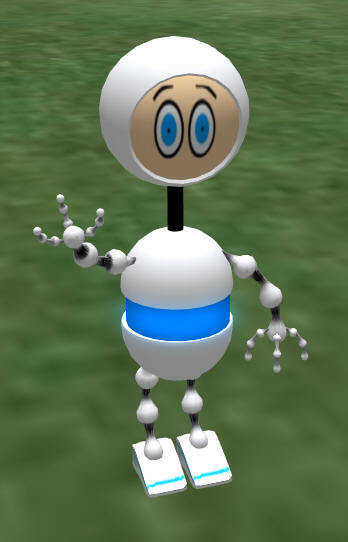 Step 2: Position your robot prims so that it is standing vertically in a 'Stand' pose. Step 3 - Add a blank note card named "Movement" Add the Compiler script. Step 4 - Add the Animator script. I find it very easy to animate if I set the base prim to a rotation of <0,0,0>, and to set the prim to some standard , even Grid numbers. You do not have to do this, it just makes it easier to recover from mistakes in editing. Click the [Name] menu item. The system will chat instructions to you for a channel to use. 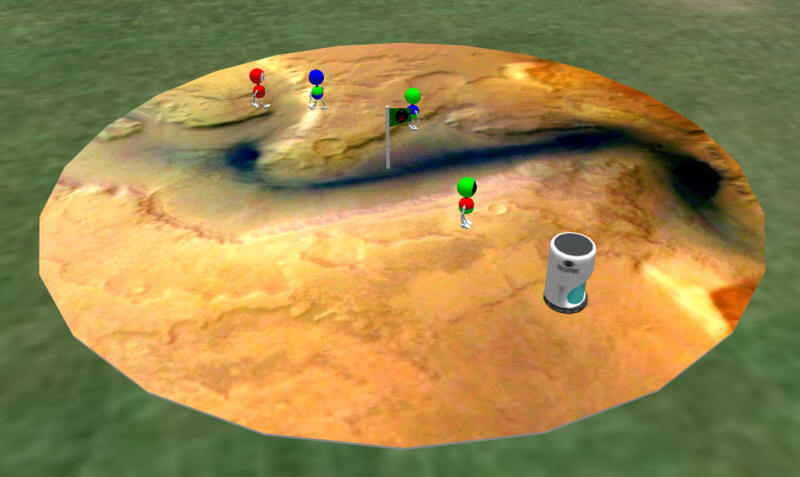 A piop up box will appear asking for the name of the animation. The menu will re-appear. You can click ignore or leave it open. 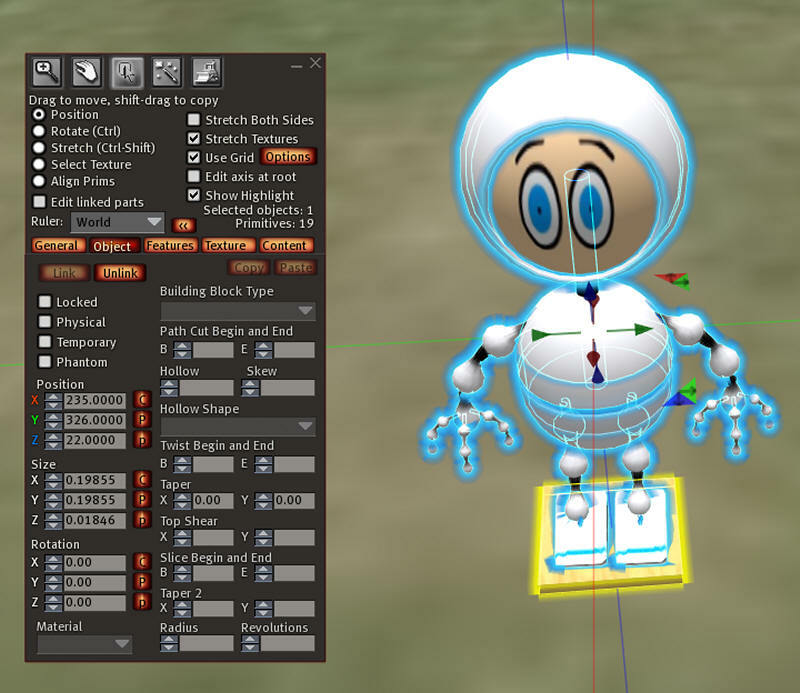 Edit the Robot and then select the Edit Linked Parts checkbox. Press and hold shift and unselect the base. 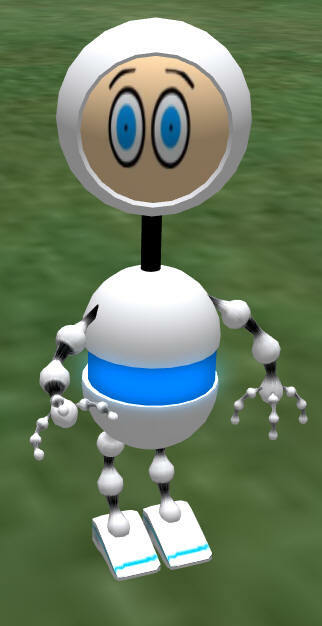 All other prims in your Robot should be highlighted. Move these prims very slightly so that the recording process will see that their positions have changed slightly. This will establish a baseline animation. The scripts will always play back this baseline animation before doing any other animations. This lets you move a small piece of the pet instead of the entiore pet for each animation, and takes up much less memory. Now click the [Record] button and your first animation is complete! The Menu will now have a [stand] button. Enter the name 'left' into the dialog box. Now click the menu item for [stand]. 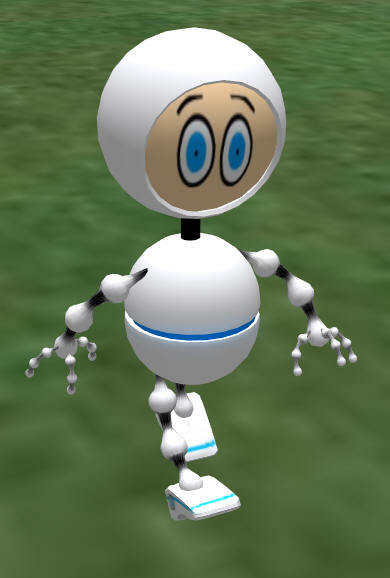 The robot should place itself back in the standing position. Now enter the word 'right' into the dialog box. Position the right leg forward, the right leg forward, and make the arms the opposite. 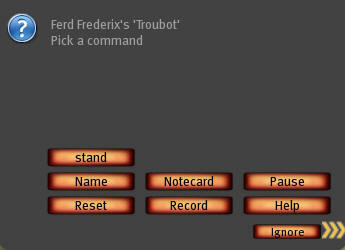 Now click the menu item for [stand], then [left] and [right] and you will see how it looks when walking. Click [stand] again to get back to the default position. Now position your robot as if it were sleeping. You can move any prim except the base. The Robot has an animation for when you click the Home post, or when a female or make sees a chance to to breed. 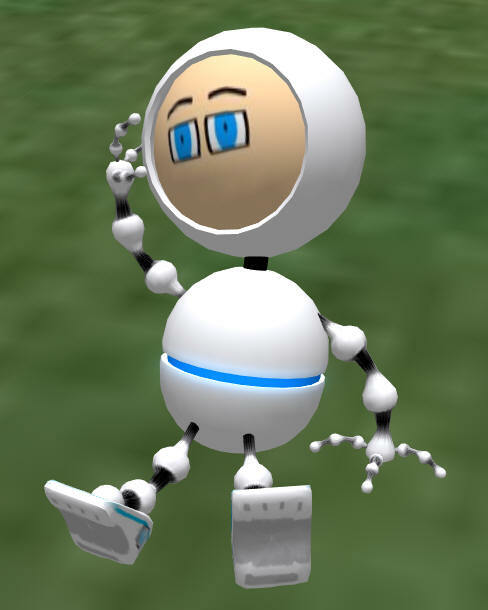 Click [stand] to get the Robot back to the default position. Now click [Pause], Enter in a number such as 500 for 1/2 second delay, and move the arm again. Pause will add a short delay. You can also move the head up and down, and if your belly band is large enough, move the stomach apart. Add pauses and make him wave both arms. When you are done, you will no longer need to save the animations in the note card "Movement". Instead, click "Compile"
A large bunch of text will appear in chat. Widen your chat window so you can see, and copy all the text where indicated. Highlight all these lines and press Ctrl-C to copy them. You want every line from the one that is labeled 'start' all the way to the end. Now paste these into a new script. You can give this script any name. Delete the "DEBUG prim animator timer.lsl" script. You can delete the animation and compiler script when the tests pass. 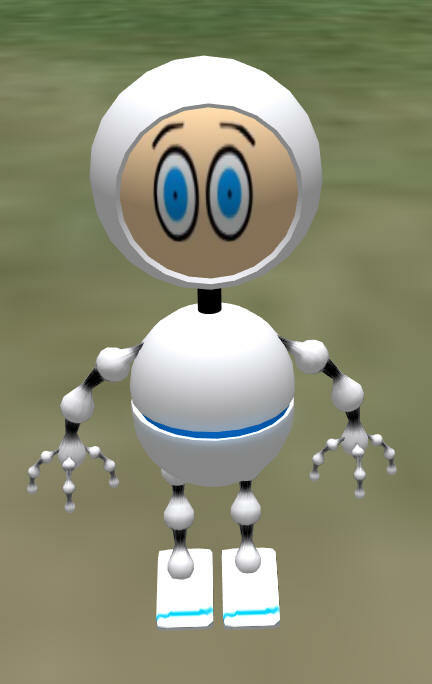 Here is a video showing how the pet Troubot Robot moves, and how the eyes change. Once you add these, you cannot add any prims to your Robot. You will not be able to adjust any individual prims except via animation. But you can shrink or grow the entire Robot after this step, before you package it. Remember to replace ALL of the Troubots in both of your spaceships. 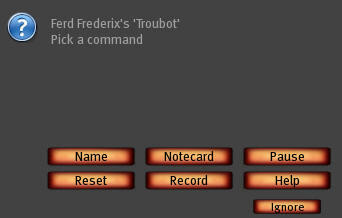 You need to package the Troubot and re-rez it so that he has an egg and a copy of the Troubot in it. I hope you enjoy your new pets! Plese send me pictures to fred at mitsi.com and tell us how you are doing with your own pet animal!